Eastern Europe, in this book, embraces the area formally referred to as the ‘Marchlands of Europe’, sometimes as Eastern Central Europe, and which included, when this book was originally published in 1971, Yugoslavia, Bulgaria, Rumania, Hungary, Czechoslovakia, East Germany and Poland. 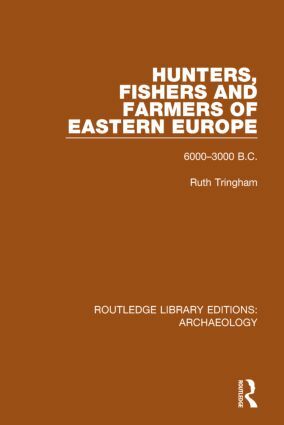 This book presented for the first time the archaeological material related to the prehistory of Central and West Europe, describing the evidence for the earlier prehistory – settlement patterns, means of subsistence and material culture – in the various natural environments of this area. It looks at the Baltic coast, the north and east European plains, the Carpathian mountain ring, the Danube basin and the Adriatic and Black Sea coasts. The evidence for late Mesolithic hunting-fishing groups is examined, their techniques and their reaction to the introduction and spread of agriculturalists, as well as the development and activities of both food-gatherers and food-producers until the early use and manufacture of metal objects. 3000 years of prehistory are covered in a way which is designed to be intelligible and useful to all those who are interested in prehistory and in eastern Europe.